AFRICANGLOBE – If you were to ask 10 strangers to name the most powerful African Americans working in Hollywood today, you’d probably hear names like: Oprah Winfrey, Tyler Perry, Will Smith and Denzel Washington. The name you would probably not hear is “Byron Allen“. This is pretty insane when you consider that Byron Allen happens to be one of the most powerful and successful producers currently working in the entire entertainment business. Byron Allen was born in Detroit, Michigan on April 22, 1961, but grew up in California, near Burbank. His mother worked as a publicist for NBC Studios, and he would spend his free time watching all of the various productions during rehearsal and taping. He would often sneak onto the set of “The Tonight Show with Johnny Carson” and pretend to be the talk show host. Consequently, he knew from an early age he wanted to be in the entertainment business. Byron got his start performing stand-up while still in high school. He performed in various venues all around Los Angeles beginning at age 14, making a name for himself with his relaxed, easy style. One day, Jimmie Walker saw Byron perform, and invited him to join his comedy writing team. It was an unprecedented honor for a 14-year old kid and he was paid $25 per joke. His fellow writing team members included Jay Leno and David Letterman. When he was 18, he got more than the chance to sneak onto the “The Tonight Show” stage. He was invited to perform a stand-up routine on the show, becoming the youngest comedian to ever perform on the popular program. His one-night gig on “The Tonight Show” was so successful that it led to an offer for Byron to co-host a new talk show called “Real People“. While co-hosting “Real People”, he took the opportunity to learn as much as he could about producing, directing, advertising, and how money really worked in the entertainment industry. He spent his spare time creating relationships with various television stations, speaking directly with advertisers, and becoming acquainted with everyone he could behind-the-scenes. In the early 90s, Byron began shifting his focus to producing. He founded Entertainment Studios in 1993 with his mother. She still works at the company today. Together, they quickly produced their first show, “Entertainers with Byron Allen“. The one-hour, syndicated interview series is still on the air, and features him interviewing current television and film stars. “Entertainers with Byron Allen” was just the beginning of his producing career, however. Since then, he has grown Entertainment Studios into a powerhouse, by doing something no other distributor has ever done. 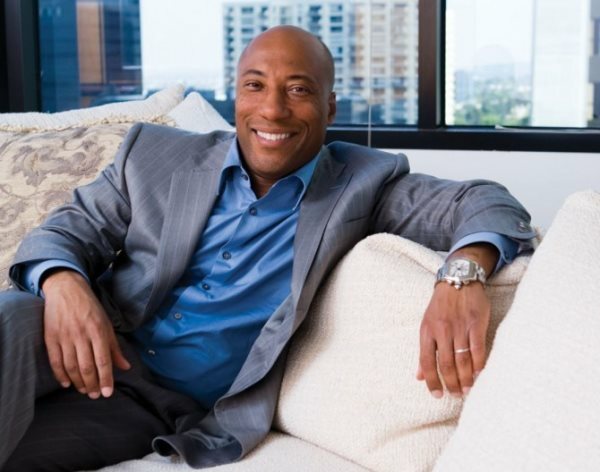 Through Entertainment Studios, Byron Allen produces 32 different television series, including “Cars.TV”, “America’s Court with Judge Ross”, “Comics Unleashed”, “Beautiful Homes & Great Estates”, and “The Young Icons”. If you haven’t heard of some of these shows, it’s okay. You’re not the only one. Entertainment Studios is the largest independent producer and distributor of first-run syndicated programming in the world, and it also produces programming for six different 24-hour HD networks, including MyDestination.TV and Recipe.TV. And even though Entertainment Studios might look like your typical production company from the outside, the company is anything but typical. Step 1) Production company sells a show idea to a TV network. Step 2) The TV network pays the production company a flat fee per every episode to produce a season of TV. Step 3) The TV network goes out to advertisers and tries to make more money selling ads than it pays for the actual show. For example: Jerry Bruckheimer Television sells a TV show called “CSI Miami” to CBS. CBS agrees to pay Jerry Bruckheimer Television $1 million for 23 episodes of CSI Miami. CBS then goes to advertisers like McDonalds, Coca Cola, Viagra, Lipitor, Ford etc… and convinces these companies to buy advertisements that air during CSI Miami. When it’s all said and done, CBS better be making more money off the advertising than it’s paying for CSI Miami. In this case, more than $23 million. If not, the show gets dropped and can typically never air again because CBS owns the right of first refusal. Rather than relying on the traditional model, Byron Allen does something no other production company does. Instead of charging the networks huge fees for the rights to his shows, he gives away his shows for free. Yes, you read that correctly – for free. In exchange for giving the content away for free, Byron is given the right to sell 50% of the show’s available advertising time, which he then sells directly to brands like Proctor & Gamble, McDonalds, PepsiCo and many more. Whatever he can get for those ads, he keeps. And these dollars are frequently much higher than what he would receive under a traditional production deal. Step 1) Entertainment Studios produces a show on the cheap. Step 2) Entertainment Studios gives that show away to networks for free. Step 3) Entertainment Studios gets to sell whatever it can to whoever is interested in buying, for any price they are willing to pay. All Byron cares about is getting his shows on the air. He’s less concerned with the production quality of the show, and more concerned with where he can get it placed, and how much advertising time he can get in exchange. He then sells the time, most of which is late at night or on Saturdays and Sundays, and walks away with the money. If a show gets canceled on one network, he is able to simply move it to another network, because he never gives away ownership rights. If a show becomes very popular, he sells it to more than one station. When you combine the fact that his shows are 100% family friendly and typically attract very large audiences, Entertainment Studios is able to make a killing off selling direct to brands. The end result, is that his company, which he originally launched in his dining room, now has more than 100 employees, its own studio space, administrative offices in Los Angeles, New York, Chicago, Atlanta, Raleigh, and Denver, and a yearly revenue topping $100 million. Advertisers are clamoring to buy advertising time with him, as well, since he can charge lower prices for the ad time, while still reaching 35 million viewers, largely due to the sheer number of shows he has running. Byron owns 100% of Entertainment Studios to this day. The company owns over 4000 hours of programming. These statistics are impressive enough to rival both Oprah and Tyler Perry’s production businesses. And yet, Byron Allen somehow manages to fly totally under the radar! He has been referred to as “TV’s Undercover Mogul”. In other words, the man is doing well. As network television scrambles to make money, and immediately cancels those shows that are “underperforming”, Byron Allen keeps churning out new projects, including scripted programs such as “Mr. Box Office” and “The First Family”. He then “sells” them with next to no difficulty. This is one stand-up comedian who found a way to laugh all the way to the bank. 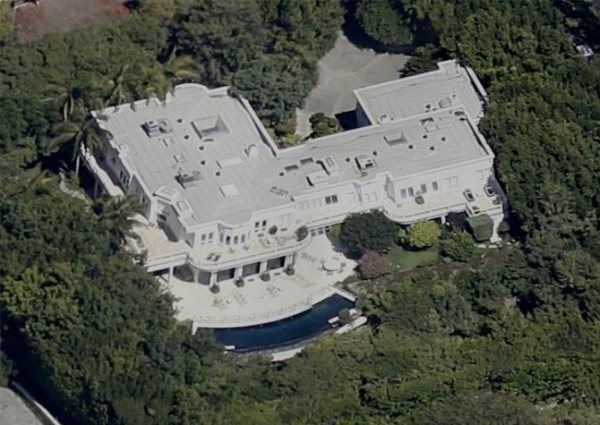 He’s one of the most powerful and wealthiest producers in Hollywood, and yet for some reason, most people have still never heard his name and wouldn’t recognize him walking down the street! That’s probably the best combination of fame and fortune you could ever want.